You know that kid in high school who always asked the teacher questions when everyone was ready to leave the class for the day? Or the kid who was always the first to volunteer to do a problem at the board because they were weirdly way too excited about the subject matter? Or the kid who enjoyed studying for hours-on-end for their exams and during classwide review sessions would school everyone else in the class because they didn’t know how to control their love of the subject to allow other people the chance to learn? As a kid I would pilfer my brother’s homeschool paperwork from the folder where my mom kept it and trace the exercises and words so that I could have my own copy of work to complete. Sure I may not have understood what in God’s name I was doing, but I liked the idea of having homework and learning and I wasn’t ashamed of it. Fast forward 12 years to my senior year of high school and the only thing that had changed was that I didn’t have to create my own homework before completing it. My favorite class (I use that term loosely.. 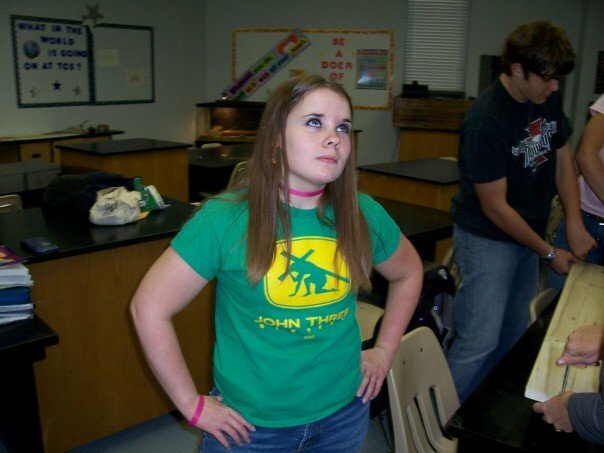 I loved ALL of my classes; all for different reasons) was physics. Physics combined math and science which were the two classes I had to work harder at (my love for each class grew with the additional effort I had to put into being good at the subject), and it encompasses every part of the physical world. The more we learned about physics, the more I loved it. I was sad to see my senior year of high school end because I was going to have to say goodbye to the AP Physics class of TCHS. This class was my favorite class for a myriad of reasons, both intellectually and anecdotal, and I remember it very fondly. Now for most of you reading this, y’all went to school with A LOT of other people, and your classes were generally large. Very few of y’all went to a school like TCHS. There were five students in the graduating senior class of 2006, and the makeup of the AP Physics class was 3 seniors (me, Dani, and Sheila) and 2 juniors (Valerie and Josh). Of the 5 students in the class, 4 of us had known each other for 10 years and the other classmate for 6. We were like our own little family and we all loved it. For that school year, the administrators hired a new teacher who was supposedly excellent with physics and math. I had high hopes for the class because she seemed to have her ish together and had a good plan of action. Two days later we were informed that she had resigned from her position (no explanation given), and that we were going to find another teacher “at some point.” The next class we were greeted by one heck of a goofy guy named Mr. Agnes who opened with this statement, “So, uh.. I didn’t study science in college.. And I’m not great at math.. But I’m your new physics teacher, so let’s get to it!” Apparently the need for a warm body to be in the class was greater than the need to have someone who knew the subject matter to be teaching, but none of us complained because Agnes. was. awesome. Mr. Agnes was very honest about his shortcomings in physics and for the first few days he’d have us read sections out of the book and then have us answer the questions at the end. 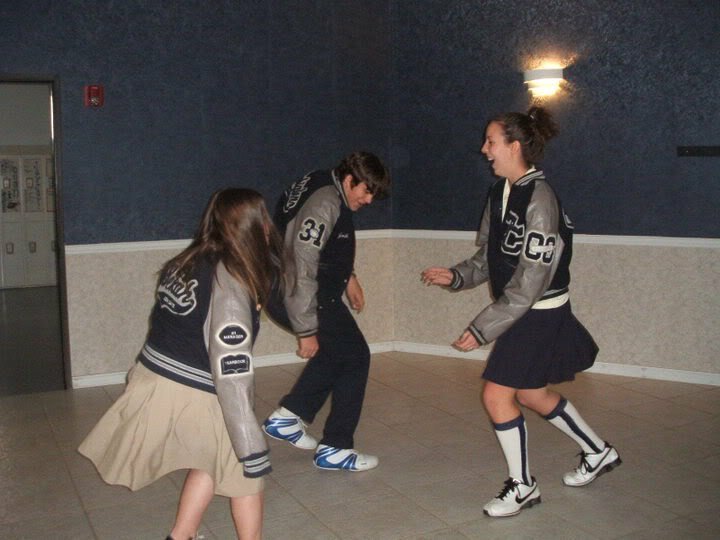 Those efforts didn’t last very long though because none of us knew what we were doing, so then we would just have really long discussions about whatever we felt like talking about that day, and we learned some pretty clever ways to sleep through our chapel classes and not get caught. The knowledge Agnes “lacked” in the realm of physics was wholly made up in practical life experiences. The one thing we did do that was remotely related to physics was discuss inertia for a couple days straight so that if one of the head teachers came in to observe unexpectedly, Mr. Agnes could make a statement about inertia and then the five of us would chime in and add to the discussion. At the beginning of each of these class periods with Mr. Agnes we would go over our speeches about inertia and then we’d cut loose and do silly things. A couple weeks after Mr. Agnes had been assigned to us, we were given a third teacher. Her name was Mrs. Reya and I despised her. I’ve never been one to deal well with change, and TCS had a history of ripping the rug out from under me in terms of teacher changes mid-year. In 3rd grade we started with Mrs. Lowry and in the spring semester we had Mrs. Wagner. In 4th grade we started with Mrs. Chestnut, who was replaced by Mrs. Brown (NOT my mother) for an interim period and then Mrs. Whitmire was brought in. (By the way – Mrs. Whitmire is to this day my favorite grade school teacher.. I love that lady!) In 5th grade I got to have Mrs. Douglas who had been my brother’s teacher and I was so excited; she also left mid-year and was replaced by the devil’s sister Mrs. Garza. That woman was one strange, tempermental woman, and life was awful that second half of the year for me. Those were all very difficult things for me to process, and now within the first 6-week grading period in my senior year of high school, I was experiencing the same craziness. Mrs. Reya knew her physics, though, and by the end of the 2nd 6-week cycle I had warmed up to Mrs. Reya, and it was a sleeve of Fig Newtons that did the trick. I have a lot of favorite foods, potatoes reigning supreme over everything else, but Fig Newtons are one of many food items that contend for the #2 spot in my heart (or stomach?). As with all physics classes, we learned about Isaac Newton pretty early on, and one day – before I had decided I like Mrs. Reya – I told Mrs. Reya that she should be providing us with Fig Newtons because clearly Isaac Newton was the Father of Physics and Fig Newtons. She showed up the next day with a carton of Fig Newtons, but to ensure our involvement in the day’s activities, she would only give us one if we answered a question correctly. This was one of the many things about Mrs. Reya that started to melt my icy exterior. Another thing that started to change my mind about her was her review process. I can’t say enough about that woman to describe how she was able to excite the class (minus Josh, the only guy in the class and the only one who didn’t get excited about anything but quoting Dane Cook and singing Fall Out Boy with our friend Trey) and get us to participate in the discussions and reviews. She would write out notecards with review questions on them and make it a competition between the five of us to answer whenever we were called on; whoever answered the most questions in that period was able to take home the review cards with the answers on the back as an additional study guide. I was genuinely interested in the subject to begin with so “getting me excited” about reviews wasn’t necessary, but after touching one of those notecards for the first time I knew I had to win the review challenge every. single. time. I have no idea where Mrs. Reya purchased those notecards or what they were made of, but I loved the feel of them. They were really, really smooth and a little less stiff than your Walmart brand notecards, and I have never been able to locate the same type since. I remember my eyes getting really big and having to constantly feel the cards while we were reviewing, and because my drive to possess those cards was so great, I would study like a madwoman before the reviews so I could win the reviews so I could take the cards home with me and spread them out and just touch them. And yes, I realize how very disturbing that sounds, but it is God’s honest truth. This may or may not have had anything to do with the better part of my OCD tendencies being associated with the sense of touch, but with God as my witness I won every single one of those review challenges. In the second semester of the class my fellow classmates caught on to the actual reason for why I wanted the cards so badly, and I don’t think any of them ever understood it either. My friend Sheila – who is an incredibly intelligent individual – was upset by my thirst to possess those cards. During one review session Mrs. Reya’s card had a word problem written on it and to win that card we had to work the problem out on the board and explain the entire process and include the original formulas, etc. I beat Sheila to the punch and walked up to the board and started writing out the formulas that I was going to use when Sheila made a noise of frustration and said, “It’s not fair!” I looked up to see what was going on (I hadn’t caught on that I was upsetting people at this point, so I was confused as to why she’d say that) and I saw Sheila reach to her right and grab Josh’s baseball hat and chuck it straight at my face. What none of us except Josh knew at time though was that his hat had a metal lip in the lid. I didn’t have time to react, but Sheila’s shot was so good that as it wobbled in its trajectory, the metal lip hit me right between the eyes with a surprising amount of force. I was stunned because I didn’t know the cap had a metal lip, and then everyone started laughing out loud because it was a ridiculous scenario. After we all recovered Mrs. Reya asked Sheila what was wrong and she explained her plight. The agreement from then on was that if I won this review challenge (which I did) and any others in the future (which I also did) that I would let people take home the cards they needed help with so they could study them provided those people brought the cards back and let me take them home with me after the test. The five of us agreed that this was a fair arrangement and life was great. There was a lecture portion and a lab portion to our class, and in the lab portion my other classmates were given their opportunity to shine. Where I was very competent in theories and numbers, I was horribly untalented in execution. Sheila, Dani, Valerie and Josh picked up on this tidbit very quickly and soon banned me from touching anything during the experiments because I had a habit of making things go horribly awry. Mrs. Reya said that I had to be part of the process though, so my job was to make sure we had all the items we needed before we started setting anything up, read the instructions for everyone else, and then writing down the numbers/outcomes after each step. Notice how everyone else is in the background actually doing work. During my last semester at ORU (you know, the semester that you sign up for fluff classes to take care of your elective credits?) I signed myself up for a Trig class and was looking for an Intro to Physics class as well, but the Trig class was cancelled right before school started and all the Intro to Physics classes were scheduled at the same time as my senior capstone courses. My group of friends made fun of me for wanting to take math and science courses as fluff, but if there had been any way around the scheduling conflicts, I would have been in both of those classes desperately trying to control my excitement about the coursework.